Unique Light Switch Plate and New Giveaway! 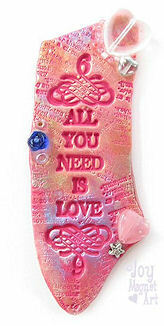 I'm giving away this pink Love magnet this month! The giveaway is open to residents of the USA, age 18 and over, and ends on February 28th. I rarely ever offer light switch plates on auction, so here is a chance to bid on something quite unique! This piece is made in the style of my Joy Magnet Affirmative Art, from polymer clay, with metallic pigments, and adorned with faceted glass beads, and other sparkly bits. It will fit around a single large (flat) style light switch. 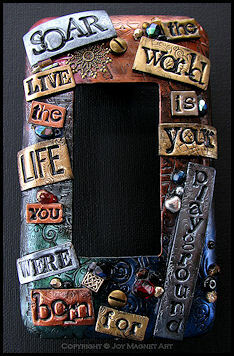 The words are: "SOAR", "Live the life you were born for", and "The world is your playground". The piece is on auction for 5 days, ending on Tuesday, February 4th. I recently created a piece that has truly been one of the most fun filled projects of my year! It is a whimsical light switch plate, with a special mouse perched on top. I've been experimenting with inserting "real whiskers" on some of my non-bird creations, and am excited with the realism that it adds! To see photos of this piece as a work in process, as well as to read more about the REAL mouse who inspired it, take a look at my Facebook album here: http://www.facebook.com/media/set/?set=a.10150286355248729.349182.137935228728.